Restaurant Gordon Ramsay retained its three Michelin stars in The Michelin Guide 2019 for Great Britain and Ireland. 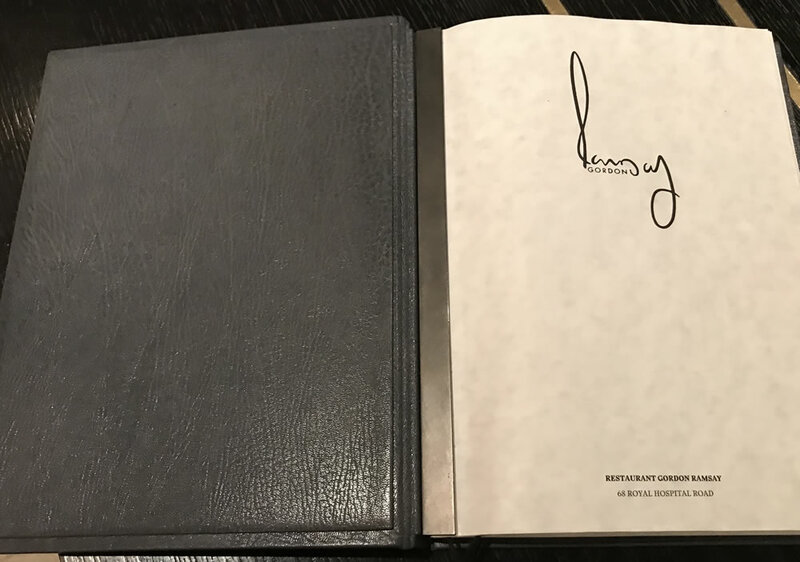 There are just five restaurants with three Michelin stars in the UK, three of which are in London, and this was the 17th year running that Gordon Ramsay has held three stars at his eponymous restaurant in Chelsea. We’re delighted for the team there - we’ve worked with them throughout that time and our Sauvignon Blanc has been the house wine at 68 Royal Hospital Road since just before they won their third star soon after the start of the century. 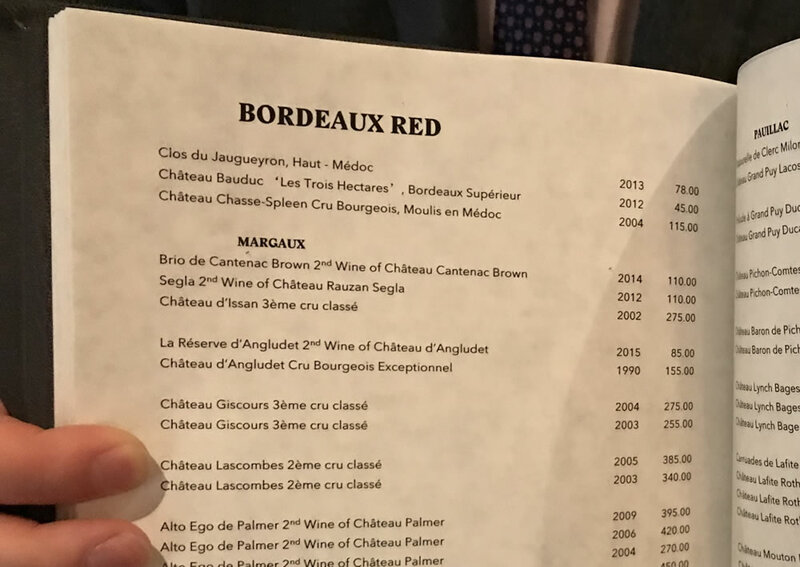 These days Bauduc is well represented on the beautifully presented wine list, with a sparkling wine, a dry white, a red and a sweet white to assist you all the way through a wonderful lunch or dinner. 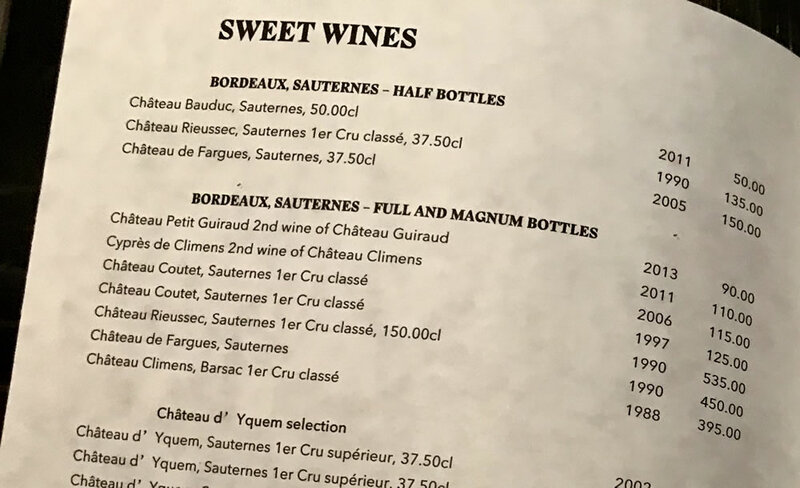 Prices are £50, £32, £45 and £50 a bottle respectively, so you'd have a wine bill of less than £7.50 a glass if you ordered all four wines, which is pretty reasonable for such an amazing restaurant. We took some pictures of the list in the autumn of 2018. 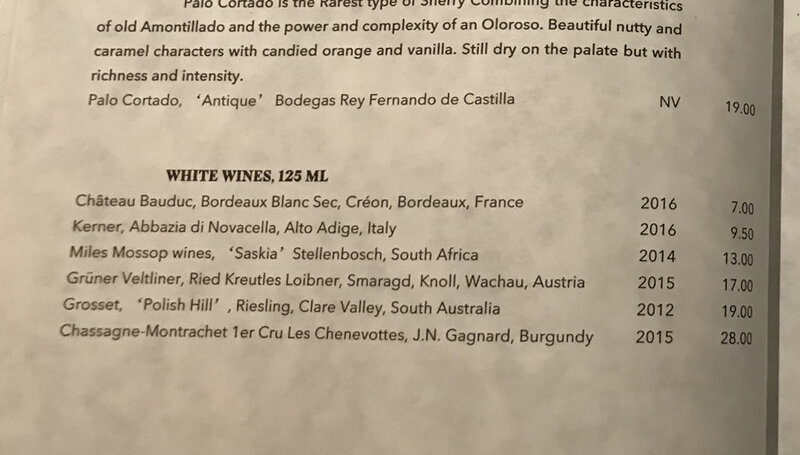 Here are our highlghts, starting with our white by the glass. 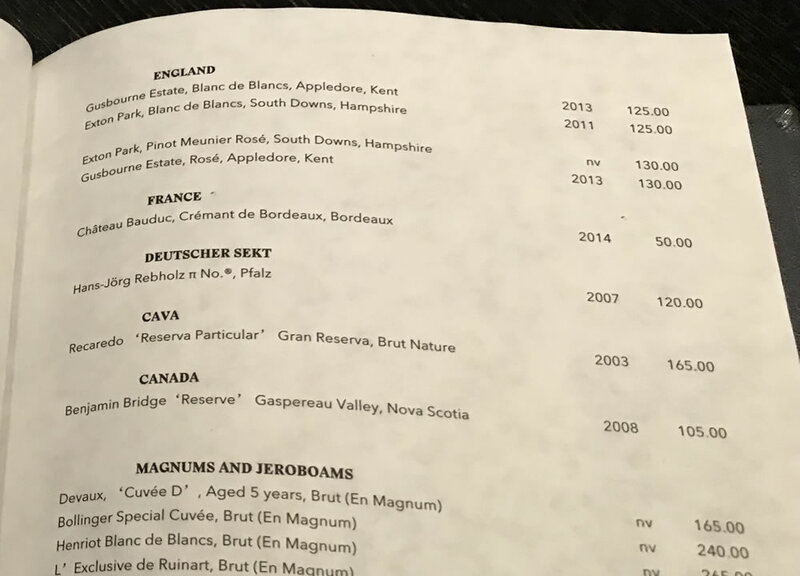 Here are some highlights, starting with wines by the glass. 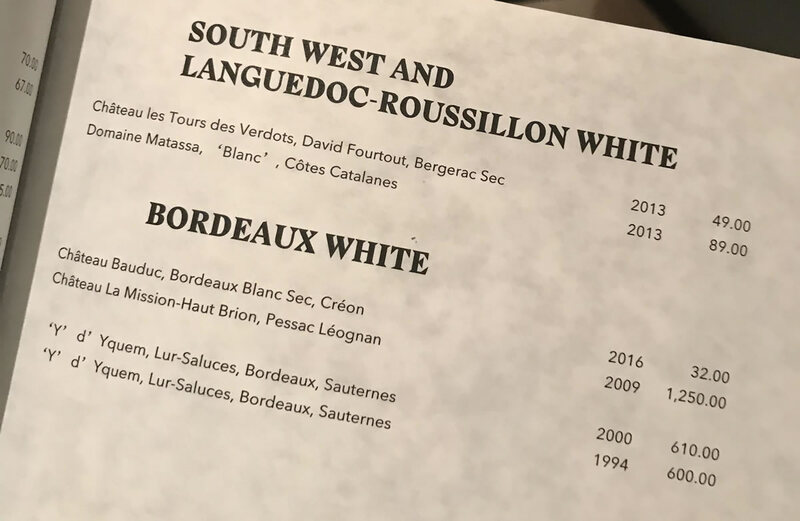 Here are the dry whites from Bordeaux and South West France. Our local town, Créon, doesn't actually have its own 'appellation' but we're rather proud that we've put it on the map. We must tell monsieur le Maire. He'd be chuffed. 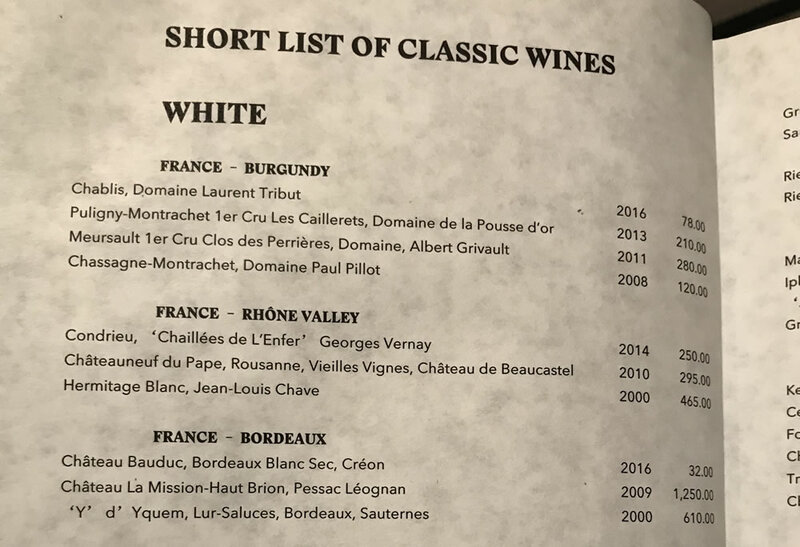 We especially like this short list of classic wines, with the Bauduc blanc listed at £32 and an alternative white from Bordeaux, La Mission Haut Brion, for a mere £1250. Our Sauvignon Blanc is available for drinking at home here. Our sparkling dry white wine is the only Crémant on the wine list at Restaurant Gordon Ramsay. Crémants are often great value, given that they’re made in the traditional method with a second fermentation in bottle, like Champagne, but come from other wine regions of France, like Burgundy, the Loire or Alsace. 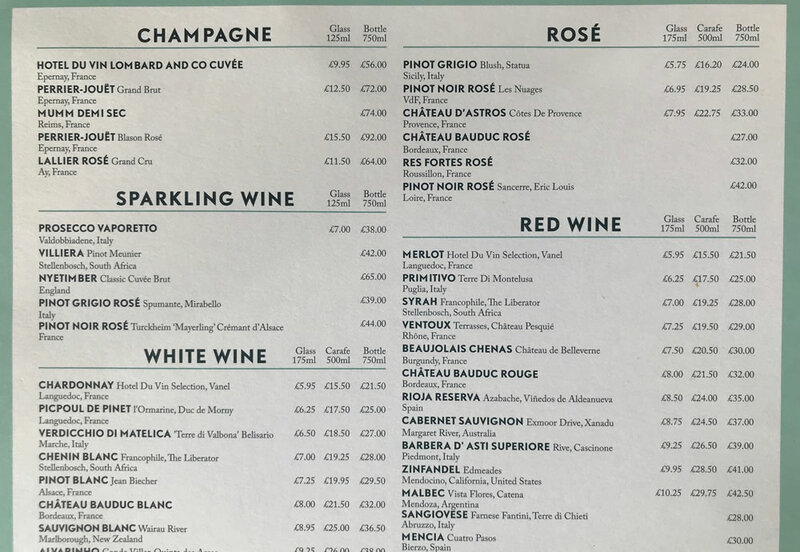 Our Château Bauduc Crémant, which was harvested by hand and ‘whole bunch’ pressed, is less than half the price of all bar one of the sparkling wines and Champagnes on the list. An excellent aperitif for a table of three to six people. Our first vintage of Les Trois Hectares for Ramsay’s was the 2003, and they’re now on the 2012. Terrific value on the list at under £45 and best decanted, of course. £7.50 a glass, in other words - the same price as many ordinary red wines in a bog standard restaurant or pub. Bauduc Sauvignon Blanc has been a house white at Rick Stein’s restaurant on the Riverside in Padstow for over 15 years. 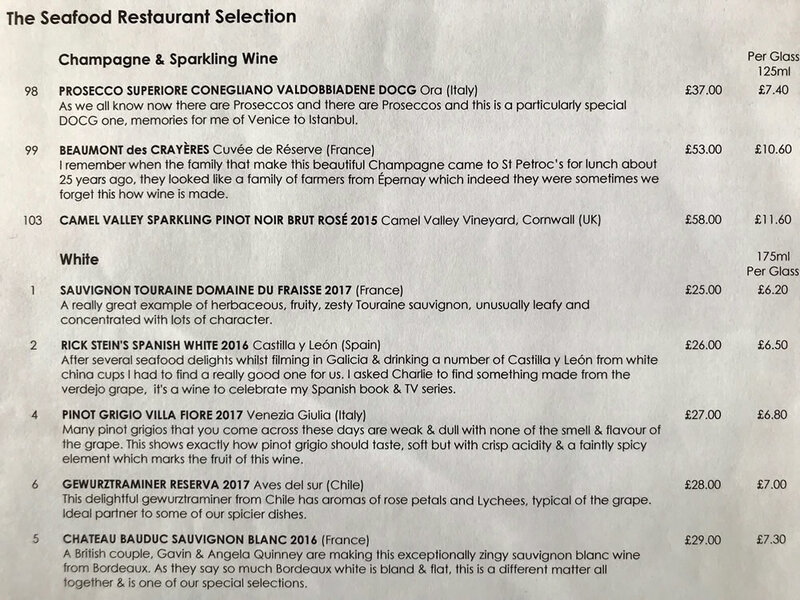 It is fantastically good value for £29 a bottle - the photo of this list is from the summer of 2018. We have supplied the restaurant with the Rick Stein signature label for a long time and the same wine can be found here. Also listed at The Seafood is Les Trois Hectares blanc 2015 and Les Trois Hectares rouge 2013. Our Bauduc Rosé has been the House Rosé at all the Rick Stein restaurants. At St.Petroc's and the Rick Stein café in Padstow, Stein Sandbanks near Poole, Stein Winchester, Stein Marlborough, and Barnes. Château Bauduc white, red and rosé - and our sweet wine - are 'prestige' house wines for the Hotel du Vin group of hotels and bistros across the UK. That's our Sauvignon Blanc, Merlot cabernet and Rosé. They can be found at Hotel du Vin in Birmingham, Brighton, Bristol Avon Gorge, Bristol City Centre, Cambridge, Cheltenham, Edinburgh, Exeter, Glasgow, Harrogate, Henley-on-Thames, Newcastle, Poole, St. Andrews, Stratford-upon-Avon, Tunbridge Wells, Wimbledon, Winchester and York.